If your in the Madison area in April come check out the run side of racing. I mean look at this flyer how can this not be a good time. 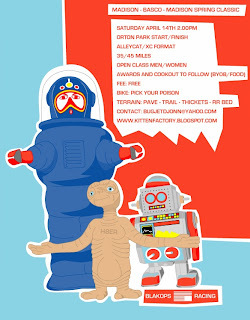 I will be at Bike O Rama this weekend helping my guys at Planet Bike out. It is one of the largest bike show in the Midwest so come see me at the Planet Bike booth on Sunday between 11-2pm.